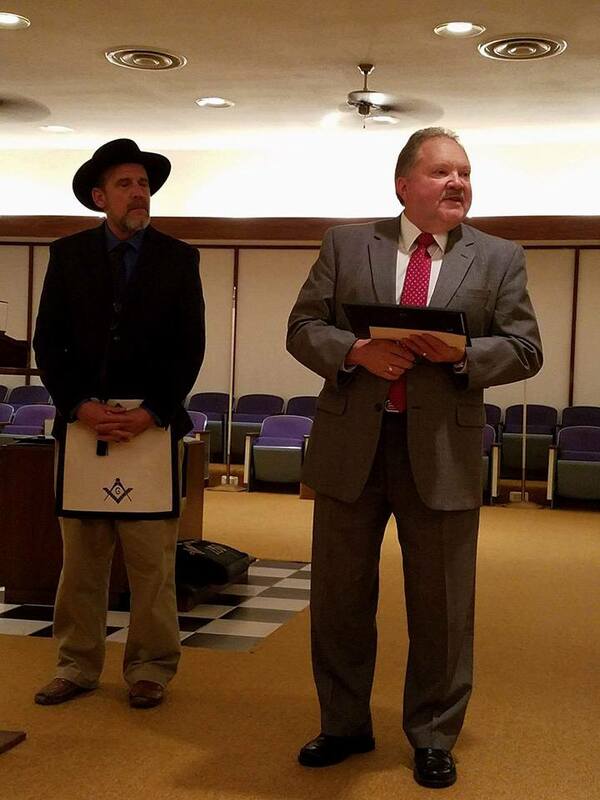 At the December 2016 stated meeting, Waco Masonic Lodge #92 had the pleasure of honoring two men in the Waco community: Brother Brett Carroll, a past master of our Lodge, and Dr. Elton Stuckly of Texas State Technical College(TSTC). as an electrical technician before returning to TSTC where he has worked as an instructor, department chair, division director, Vice President for Student Learning, and as campus President of TSTC in Waco. Dr. Stuckly is the first graduate of the state-wide school to return and serve as President. In his currrent role as Executive Vice Chancellor and COO, Dr. Stuckly helps to lead the school forward as a pioneer institution in the career-specific education of young minds at a reasonable cost. 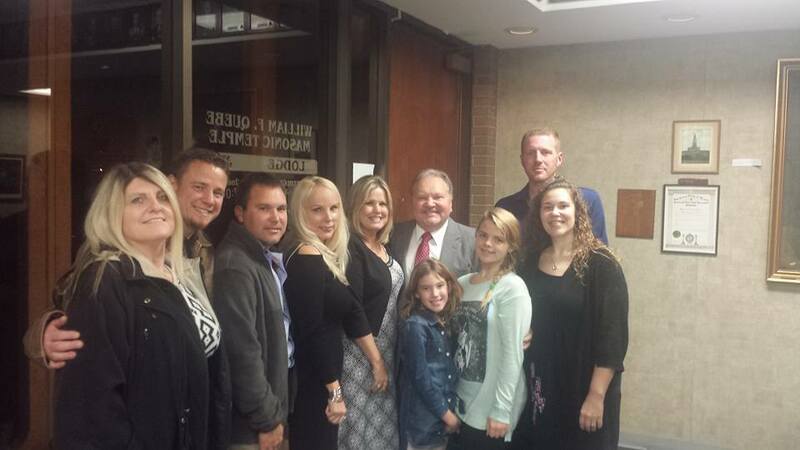 Deeply committed to giving back, Dr. Stuckly is always finding ways to help build the community around him. He has been on the Board of Directors for the Waco Rotary Club, several Greater Waco Chamber of Commerce committees, and the Advisory Board to Waco ISD. Dr. Stuckly was an essential catalyst for both the Early College High School program at Rapoport Academy and the Greater Waco Advance Manufacturing Academy of Waco ISD. Association; Habitat for Humanity Community Service; and as an American Heart Association Heart Walk Co-Chairman. Dr. Stuckly has also been very involved with various state and national groups including the Texas Workforce Energy and Construction Training Steering Committees; University of Texas Technology Advisory Board; Texas A&M Nuclear Power Institute Advisory Council; Gulf Coast Consortium; Fort Bend County Chamber; and achieved educational partnerships across the State of Texas and Mexico. He was instrumental in the establishment of workforce programs for TSTC with notables such as Flour, Bechtel, Exxon Mobil, L-3 Communication, NASA, and the Baylor Research and Innovation Collaborative (BRIC). Altogether, there is no doubt that Elton Stuckly is a builder of community. Waco Masonic Lodge #92 is very proud to have recognize his many years of service. 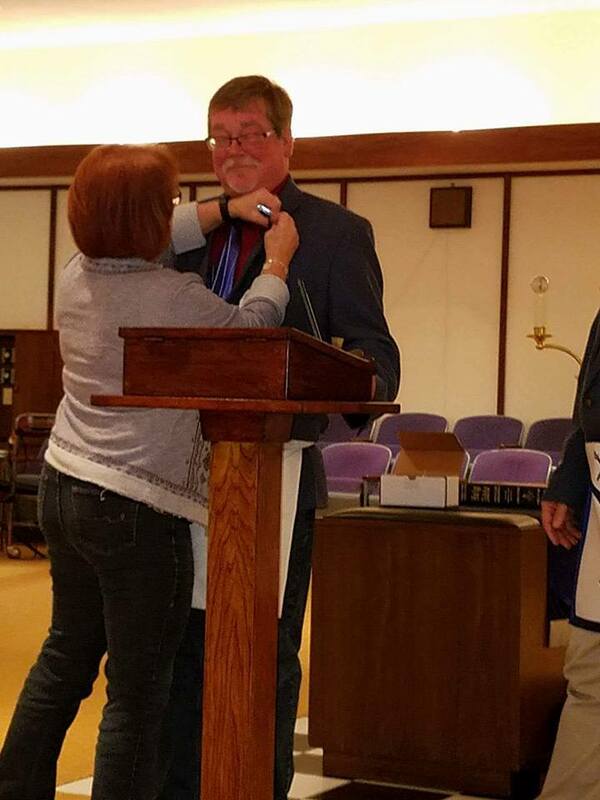 Robin Carroll puts the 2016 Golden Trowel pin on her husband’s lapel. for her support in his masonic efforts and for understanding how Masonry can sometimes require a man to spend extra time away from home… Past Master Jeff Davies for serving as Bro. Carroll’s instructor and for being the first man to welcome him when he first visited Waco 92… Past Master Ed Brown for being a good friend and fellow instructor of the lodge… and others. 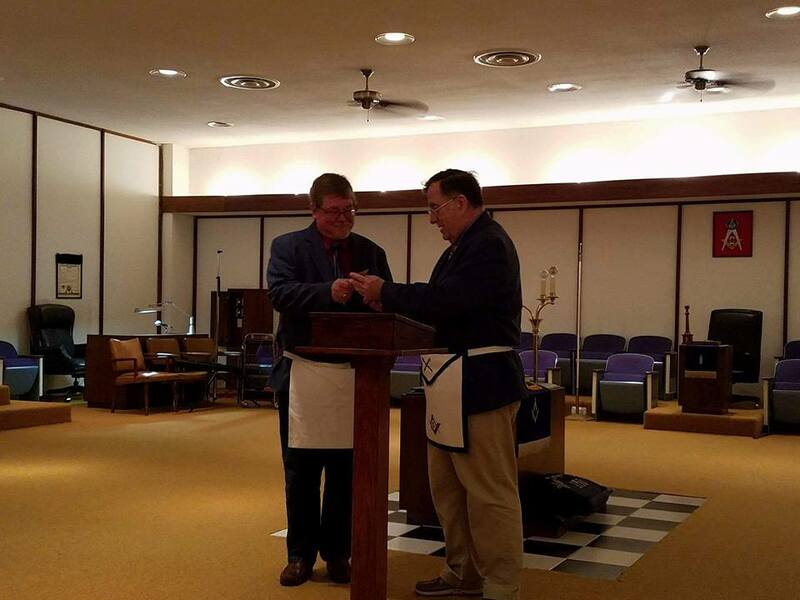 Brother Carroll recalled how Masonry has changed his life since the very first time he set foot in a lodge on the recommendation by a friend. Brother Carroll praised the fraternity’s ability to take the insecurities of a man and replace them with a strength based on community and fellowship. 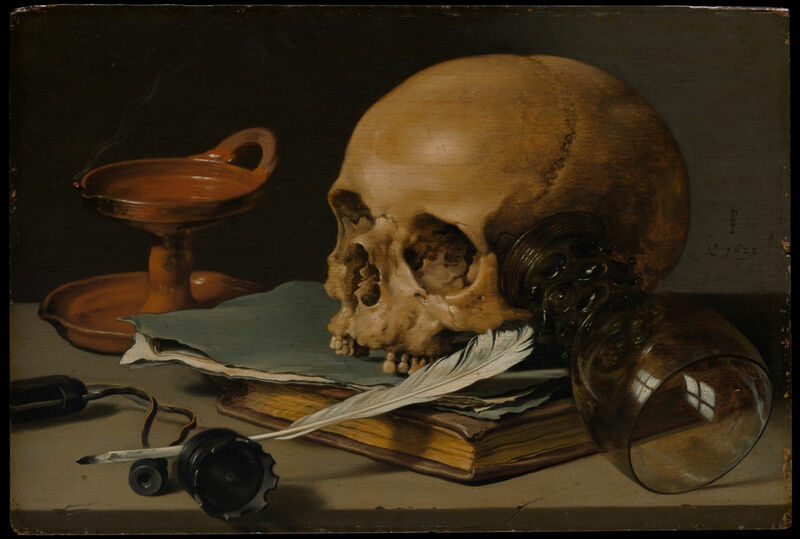 He also remembered how, at a young age, he had asked his father about what masonry is and how to become one only to have his father suggest that he await the time with patience until he could find out for himself. Later in the evening, Past Master Ed Brown thanked Brett for his friendship and pointed out that their friendship has proven to be that singular kind of friendship one can go to another in times of stress and find relief. Past Master Jeff Davies praised Brett as having been one of the best students he ever had. Pat Master Tom Waden presented Bro. Carroll with a painted brick depicting essential masonic allegory, the very tools of which Bro. Carroll has endeavored to teach new masons how to properly use. Also in attendance were Brother Carroll’s brother Gary Carroll, also a member of Waco 92, and his close friends Mark Vinson, a long-time Tiler of our lodge, and Brad Betts of Crawford Masonic Lodge.